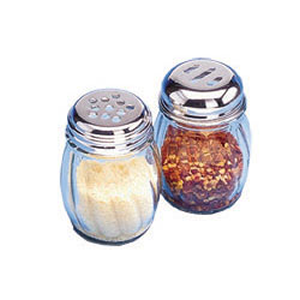 Glass Swirl Spice Jar 6 oz. Creating the perfect pizza parlour experience at home is all about the details. Our cheese and pepper shaker jars do just that. Package contains two jars one with slots and one with holes. Wildwoods pizza shaker jars are one of those great kitchen accessories no home or restaurant with a wood fired pizza oven should be without. Each set contains 2 jars which have a stylish glass swirl design and lids with holes and or slots for parmesan cheese, crushed peppers, oregano. A great addition to your table, these are a must have for creating the ultimate pizza at home.